Melt shortening in a large/huge saucepan over medium heat. Cook chicken pieces until brown on all sides and cooked about half way through, around 20 minutes or so. Remove and add onion, green pepper, celery and garlic. Cook slowly stirring now and again until onions are tender. Add sausage and cook 10 min more. Return chicken and add all remaining ingredients EXCEPT rice and stir together well. Cover and simmer for 30 min stirring now and again. Remove cover and continue to cook until broth cooks down a bit-you don't want it too thick as the rice will soak up the juice. 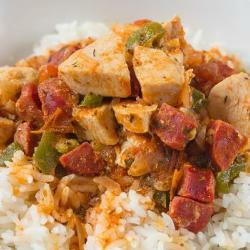 Serve up the rice in bowls and ladle the Jambalaya on top, and offer more cayenne or Tabasco at the table.